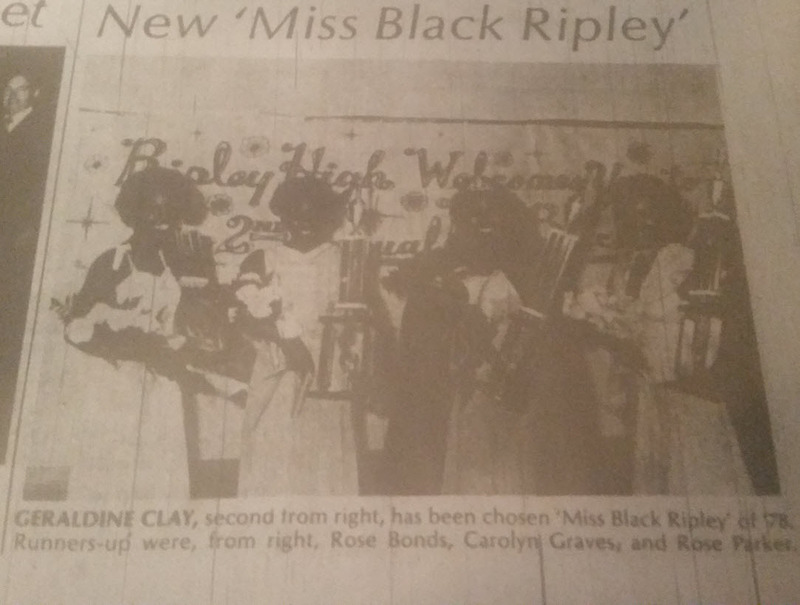 Anyone remember The Miss Black Ripley Pageants? As I have looked for information on them, I cannot help but think of what a source of pride these pageants were for the Black community. Starting in 1977 with sponsorship by the Nathaniel Lodge No. 216 and coordinated by James T. Pitts of Pitts Barbershop, these pageants featured Black female contestants in a swimsuit competition, talent competition, formal wear competition, and a question and answer competition. The first year of The Miss Black Ripley Pageant was 1977 with Jackie Springfield being crowned winner. The second year, 1978, the pageant was coordinated by James T. Pitts with assistance from Linda Russell, Christine Shaw, and Linda Cooper. On April 16, 1978 at 6:00 pm the Ripley High School Little Theater hosted the pageant. It was also sponsored by The Nathaniel Lodge No. 216. The contestants of the 1978 pageant were Johnnie M. Parker, Mary Owens, Carolyn Graves, Rose Parker, Rose M. Bonds, and Geraldine Clay. In 1978 the pageant was won by Geraldine Clay with Rose Bonds, Carolyn Graves, and Rose Parker as runner-ups. The 1978 pageant booklet contains the names and advertisements of various additional sponsors and businesses such as Berg and Shafer, Thompson’s Mortuary, Pitts Barbershop, Malone’s Bar-B-Q, Rozelle Criner Furniture Company, Halls Flower and Gift Shop, and Montgomery and Son Plumbing among others. Stroll through the 1978 pageant booklet below.